The Club offers full breakfasts, morning coffee, lunch, afternoon tea and even dinner by arrangement. Membership to the club is also very reasonable if you are in the area for a week or more each season. Visitors are most welcome. There is a tee booking system so please contact the club to book your tee time in advance. Group booking discounts are available and there are many Open competitions throughout the year. 8th "De'ils Brew". A cheeky 174 yd par 3 from an elevated tee which offers spectacular views of the Cairngorm mountains. Wild tee shots to the left may get a helpful rebound from the cottage roof. I witnessed a hole in one here last summer. 7th "Eyrie". Lob wedge to the green perched on the ridge needs to be inch perfect or if long your birdie opportunity has become a struggle to find your ball let alone make a bogey 5. Bring your lucozade. 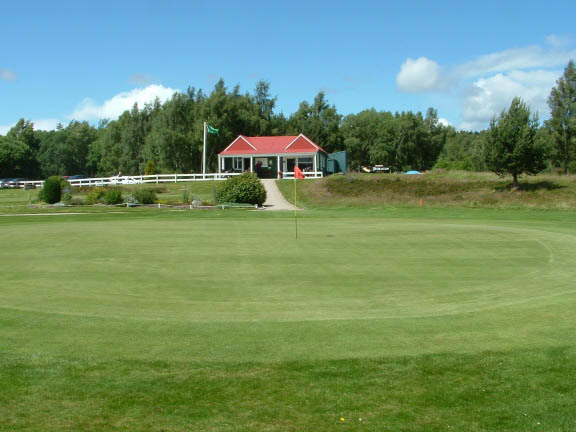 A Highland gem, this beautiful 9 hole course provides the best views of the Cairngorm mountains, a challenge for experienced golfers and loads of fun for inexperienced ones. The Club prides itself on the condition of the course, giving a warm welcome to visitors with club and trolley hire available.